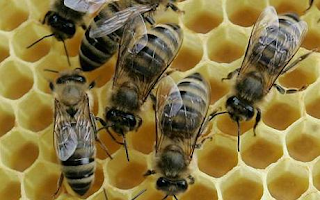 L8 Living Sustainably: Climate change and how it affects our local bees. Climate change and how it affects our local bees. Yesterday we got sad news from Terry, one of the bee-keepers from Fern Grove Community Garden, that they have lost their entire colony of bees. At first it was thought that the bees had swarmed and gone elsewhere but there are so many variables as to why this can happen and one of the causes could of been the inconsistent weather we are having. As Terry explained to me as the temperatures are up and down at the moment some of the bees become confused and leave the hive to forage for food. Consequently with the absence of the full colony, the hive can become cold and the queen and the rest of the bees can die. This clearly brings home the point about climate change and the devastation its causes to our natural world.